Captain S. H. Stringham, the new commandant at Gosport, was opposed to the magazine project at Fort Norfolk. He found the site "objectionable" because of the Navy's tenuous hold on the fort property, new industrial development in the area, and the increasing level of river traffic. He suggested building the magazine at St. Helena, a more remote location (BY&D, Letters Received, Box 156, Stringham to Smith, March 21, 1851). Stringham's counter proposal was apparently dismissed out of hand by the Bureau of Yards and Docks. In May 1851, Stringham negotiated a boundary settlement with William E. and Robert E. Taylor, the owners of the adjacent property. 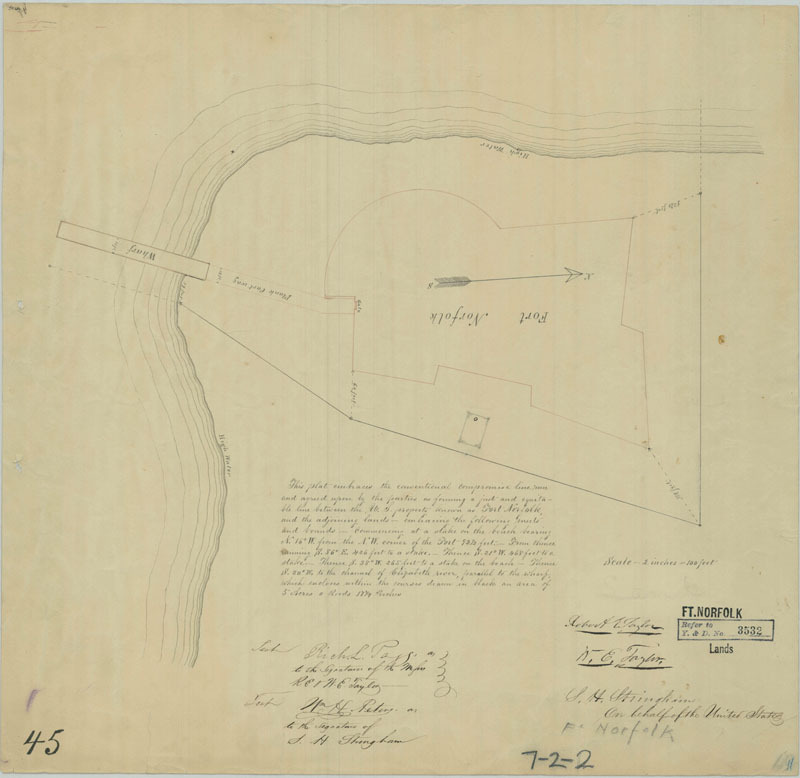 The Fort Norfolk tract then contained just over 5 acres of land (Bureau of Yards and Docks 1851) (see above). During the summer of 1851, Stringham spent $2,000 "leveling off grounds, ditching, and repairing walls at Ft. Norfolk" in anticipation of the magazine's construction. However, by October, Commodore Joseph Smith reported to the Secretary of the Navy that the proposed projects at Gosport "had all progressed, except the Magazine & the Keeper's House." He assured the secretary that "materials have been procured and the work will soon be commenced" (BY&D, Annual Reports, 1852-1853, Smith to Secy. of the Navy, October 16, 1851). Finally, in December 1851, Stringham could report that work on the magazine had begun. He had acquired enough brick and other materials "to keep the hands employed on it till spring." However, Stringham had stopped delivery on additional materials because of lack of funds. By March of 1852, Captain Samuel L. Breese had replaced Stringham as commandant. In June, Breese was informed that there was no money allocated for materials or labor to continue the work for the upcoming year (BY&D, Letters Received, Box 157, Smith to Breese, June 24, 1852). By November, the granite foundation had been laid. However, work on the magazine would not be continued until April 1853 (BY&D, Annual Reports, Report of S.L. Breese to Secy. of the Navy, July 28, 1854).